People have informed me the corporate memo is not dead as a genre, that it's still alive and well and has simply turned into email. That's just a difference in transmission mode, right? Just take off the routing slip, type the text into Outlook, and you've got what you had before. Corporate memo = corporate email. I beg to differ. I realize it's so 20th century -- which is to say, trite and clueless -- to invoke McLuhan, but here's a case where the medium is most definitely the message. I've tried to set aside the greatest hits of my corporate email, the messages from facilities or security that would've been in the Memos file I keep in my hulking black Steelcase lateral filing cabinet. But they're really not the same. They're homogenized and democratized and don't have nearly the presence. Look. 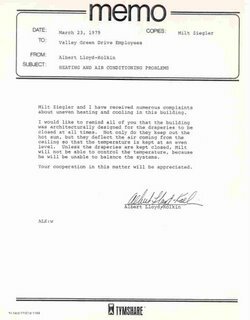 Here's a memo dated March 23, 1979 that I saved from my short career at Tymshare, Inc. The topic? HVAC, one of the trickiest aspects of facilities management. The subject of many a fine corporate memo. Note the corporate logo and that it's been typed from dictation, a lost art. The language is practically poetry. "I would like to remind all of you that the building was architecturally designed for the draperies to be closed at all times. Not only do they keep out the hot sun, but they deflect the air coming from the ceiling so that the temperature is kept at an even level. Unless the draperies are kept closed, Milt will not be able to control the temperature, because he will be unable to balance the systems. Your cooperation in this matter will be appreciated." When's the last time you received an email quite this concise, correctly spelled, appropriately punctuated, and emotionally evocative? We are witness to Milt's god-like powers in controlling the temperature, in balancing The System. We learn at the knees of our corporate mentors that drapes are not meant to be opened (and naturally wonder why the building had windows in the first place). Then there's the subtext: "Don't you go peeking out those windows! You are here. You are ours." Perfect. We received many such communiques, always on the official Tymshare Memorandum stationary, and usually with a routing slip or routing directive written right on top of the page. You can see that I often failed to pass on the memos; they'd stop when they reached my cube. I've saved them all these years, edicts to stop reconfiguring the partitions that defined our offices, warnings to stop damaging the office plants (they were rented and insufficiently hardy to stand up to the coffee poured into their pots), threats about cascading parking problems (the Tymshare people were parking in the Tymnet lot, which in turn forced the Tymnet people to poach parking from the poor Dynatax employees, who could not come to work at all, since there was no place for them to put their cars), and other timeless complaints. I can find lots of artifacts from Tymshare on the Web. I even found the old Fortran compiler, which might've been the one I was supposed to be maintaining when I went stir crazy and put all my belongings in the back of my Opel station wagon and headed back to LA. But there's nothing that reminds me more of Tymshare than those corporate memos. Without getting maudlin, without referring to Office Space, without driving by the building (now one of Apple's buildings) with its draperies permanently closed, I can re-read a memo and relive a moment in Tym.